As a Saturday morning project, I took the first serious look at Coobird’s Cannons 2000 for the first time since 2003. The program is listed as one of the programs I’ve worked on in the past in the Past Programs page at coobird.net. Cannons 2000 was originally written back in 2000, as the title may suggest (and also is a testament to how “2000” was really a suggestive of how futuristic something is, at least back in the 20th century.) and it was written in QuickBASIC 4.5. Unindented code — The entire codebase (only a thousand lines or so?) was unindented and very difficult to read. Lots of GOTOs and GOSUBs — although it appears that I was using subroutines and functions for certain aspects, it didn’t really look like I really knew what the heck I was doing. Although some parts used functions and their returns in meaningful ways and subroutines were written where they were called without using GOSUBs, some parts were littered with GOTOs and GOSUBs. Spaghetti code at its best. Poorly names variables (and functions and subroutines) — Variables like py%, setd, inv1, inv2 were all over the place. The functions and subroutines were just as bad with very descriptive names such as boom, boom2, splode, etc. No understanding of multi-dimensional arrays — There were some arrays being used, but when they required have two dimensions (e.g. a situation where each player requiring their own array for their inventory), they were using the variables inv1 and inv2, where it would have been best using a two-dimensional array. GOTOs being used for loops — Loops where keyboard input from the user is being polled were in GOTO loops, where a DO loop would suffice. Although there were some cases where I did notice how BASIC has its deficiencies. 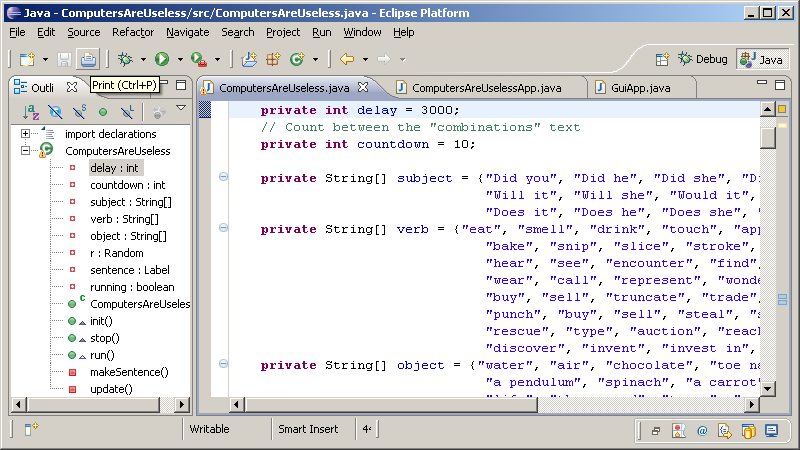 If BASIC had a facility to skip one iteration of a FOR loop, like the continue keyword in Java, it wouldn’t require a jump to a label next to the NEXT statement of a FOR loop. 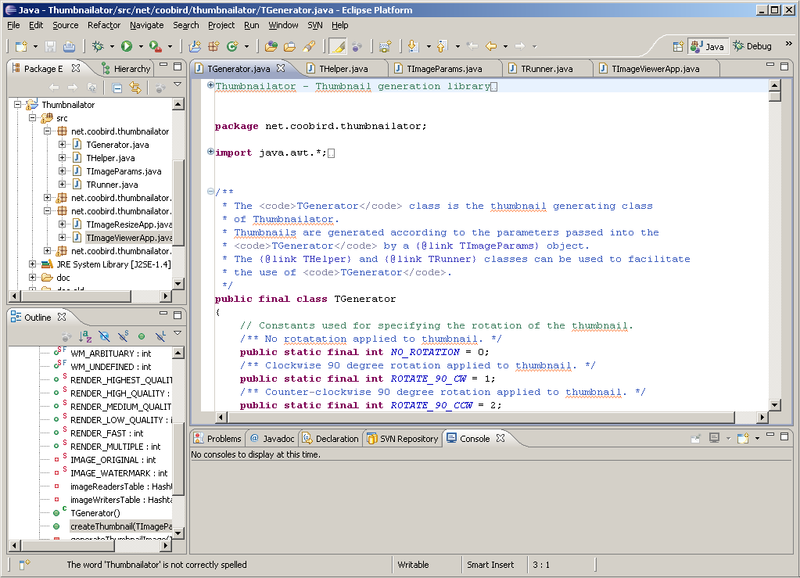 Although not all of the problems has been addressed through the code clean up, such as poor variable names and some of the redundant code (especially the subroutines which were part of what I would describe as “spaghetti logic” due to the logic being designed like spaghetti), the code was indented and the subroutine and function names have been cleaned up. However, the GOTO and GOSUB spaghetti remains, as it would require quite a bit of effort (reorganizing the code) to clean up. Coobird’s Cannons 2000 is available for download for free, released under the terms of the open source, Modified BSD license. It should be noted that it is not a robust program and reflects how a beginner would write poor code, so it should not be used as a tool to learn programming. Uses the AWT Toolkit instance for loading images. The background image can be selected from the applet and application versions of Blocks. With the applet, the HTML file which hosts the applet can pass the “background” parameter with the image to load. The application can have its background image changed by using the “-background” switch with the path to the image when launching the application. The default image name was changed to “background.jpg” from “blocks-background.jpg”. When loading the background image in the application, the AWT Toolkit instance is used to load the image. 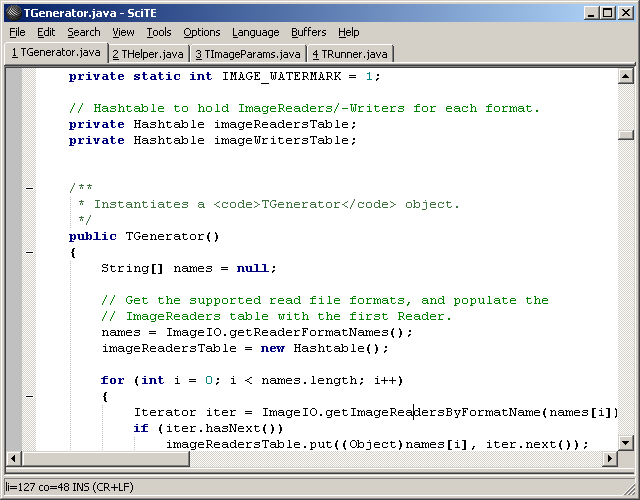 The previous release used the Java Image I/O API, which is only available with Java 2 Platform, Standard Edition, v. 1.4.2 or higher. Using the AWT Toolkit should allow JRE 1.2 or higher, although it has not been tested. Coobird’s Blocks has been released. The applet is available to play on the coobird.net website, and the Coobird’s Blocks project page has the applet, application and source code available under the modified BSD license. The Java-based block-breaking game has been in development for some time, and it is a third iteration of the block-breaking game. The history of the game along with more information is available at http://projects.coobird.net/Blocks. You are currently browsing the Coobird’s Devblog blog archives for May, 2008.